The first of two new nighttime shows will debut later this year at Epcot. As Epcot's Reflections of Earth enters its final year, a new dining package offers lagoon-side viewing. I wish there were enough stars for me to rate this with "100" instead of just "10" This is without a doubt the absolute best part of everything WDW has to offer. This show is totally breathtaking. The music alone brings tears to my eyes. The visuals are stunning. It is simply phenomenal. You cannot visit WDW without watching Illuminations. Otherwise your visit would be incomplete. It is worth the price of admission just by itself. The spirit of EPCOT Center lives on through this spectacular show. 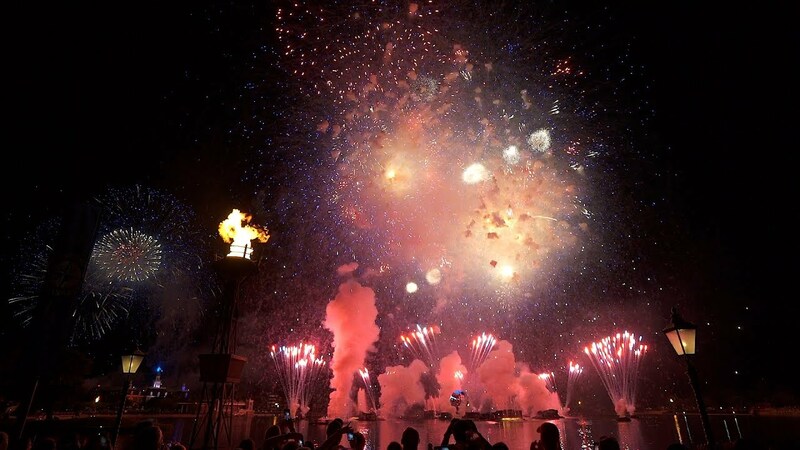 If I had to die tomorrow, my dying wish would be to see Illuminations: Reflections of Earth, one last time. It is my favorite part of my entire Walt Disney World vacation, hands down, and is, in my opinion, the best fireworks/nighttime show on property. The score gives me goosebumps, the fireworks are incredible, and the globe is also amazing. If you can only do ONE thing at Disney World, watch this show. You won't regret it. One of the greatest shows on earth! Watching it always makes me feel great. This was my favorite fireworks show! Seeing the globe drift out and come to life was amazing. A must see! IllumiNations: Reflections of Earth is a daily nighttime firework spectacular performed over the World Showcase Lagoon at Epcot. 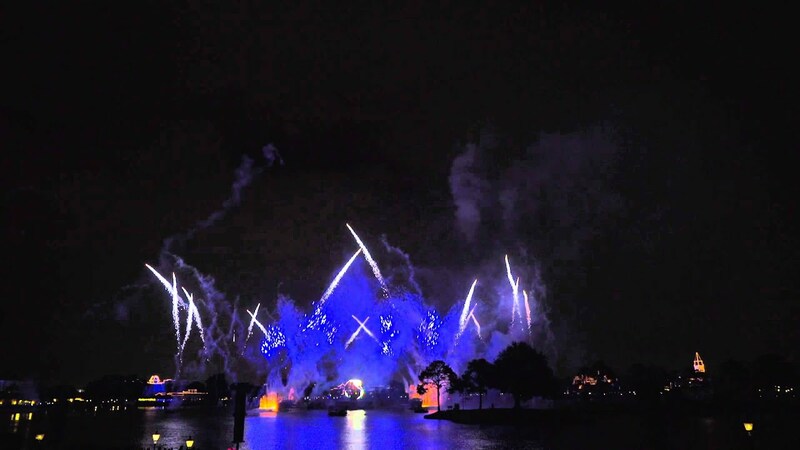 Opening Date: IllumiNations: Reflections of Earth officially debuted on October 1, 1999. Historical Notes: Previously called "IllumiNations 2000: Reflections of Earth," name change to "IllumiNations: Reflections of Earth," on January 1, 2001 following the close of the Walt Disney World 15-month Millennium Celebration. The unofficial opening for "IllumiNations 2000: Reflections of Earth" took place on September 22, 1999. IllumiNations 2000: Reflections of Earth was introduced at Epcot for the Walt Disney World 15-month Millennium Celebration as an all new show. 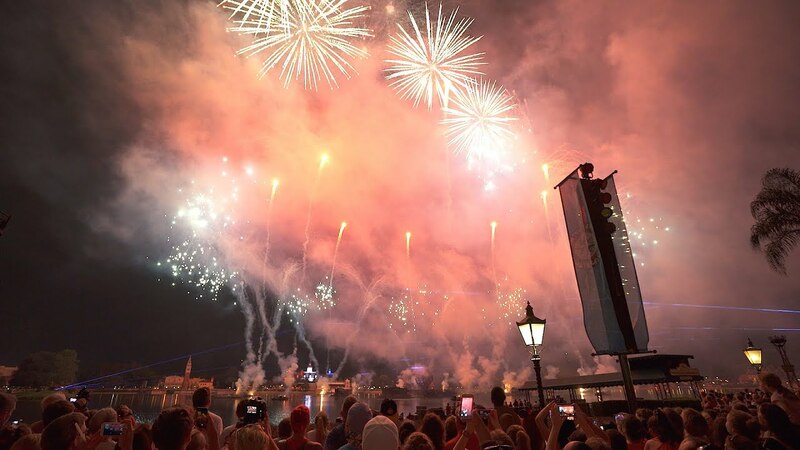 More than a simple update, the show was created from "scratch," with more than 30 percent more fireworks than any prior show at Epcot. Description: "IllumiNations: Reflections of Earth," is a nighttime spectacular filled with the fiery glow of torches, a high-energy soundtrack, sky-piercing lasers and thunderous fireworks. 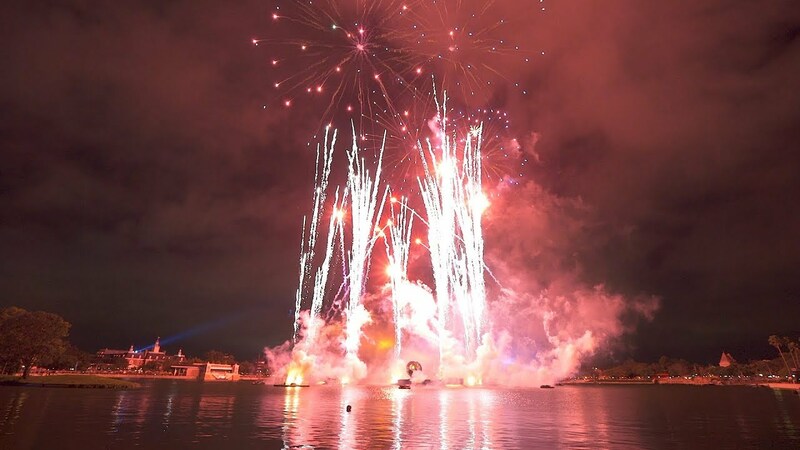 The skies above World Showcase Lagoon transform into a kaleidoscope of colorful pyrotechnic bursts. Comets streak across the sky as video images displayed across a giant sphere tell Earth's incredible tale. Then, the sphere blossoms like a flower, exposing a brilliant ball of fire and setting up the show's emotional finale. Dreams of hope for a better tomorrow are cast as the music soars, lasers shoot skyward, fireworks illuminate the night and flames leap across the surface of the lagoon. This breathtaking new show will be presented nightly during the Walt Disney World Millennium Celebration at Epcot®. • Development of the show began in July of 1997, taking 26 months to complete. • 67 Computers in 40 locations are required to produce the show. • 1,131 men and women contributed to the production of this show. o Act 1: Chaos. Presents a stylized version of the universe through pyrotechnics and fire effects. The "inferno barge" in World Showcase Lagoon will spout flames and pyrotechnics more than 100 feet in the air. o Act 2: Order. The earth globe (a rotating ball with curved screens) moves through space into the lagoon. Images of earth will be presented on the ball. o Finale: The globe blossoms like a flower, exposing a brilliant torch of fire. The music soars, lasers shoot skyward, fireworks illuminate the night and flames leap across the surface of the lagoon. o The show's video segment, which is displayed on the "Earth Globe" located in the center of the World Showcase Lagoon, features 56 famous faces and covers 5 continents (screens). o The globe weighs 350,000 pounds (equivalent to the weight of 150 midsize cars). o The main structure of each petal consists of 4 inches of thick steel plate. o The hydraulic system is capable of producing 650,000 pounds of force. o There are 4 fountain barges with 40 water nozzles per barge. o Each barge pumps approximately 4,000 gallons of water per minute. o The spectacular cosmic explosion which begins the show is made possible through the use of Disney's patented Air Launch Fireworks (ALF) technology. o 1,105 shells are fired during each show. • The lasers used during the show are made up of the full spectrum of color. o Original music for show composed by Gavin Greenaway and supervised by Hans Zimmer, Oscar-winning composer for Disney's "The Lion King." o There are 19 torches located around the World Showcase Lagoon. o The torches stand 26 feet above the water line. o The torches are powered by natural gas. There are currently 4 editions of IllumiNations Reflections of Earth. Time is a constant, but progress is exponential. From the beginning of what we know as Time up to the present, significant events come slowly at first, then faster and faster. ACT 1 – CHAOS represents what happened before Time as we know it began. ACT 2 – ORDER represents the span of Earth Time up to the present moment. As ACT 3 – MEANING begins, we must now confront the future, or the Time yet to come. Storytelling around the fire is a human tradition. This sets up the theme of "hand in hand" across generations, and stresses the importance of each individual as a link between past and future. The theme is that each individual is at the center of the action (and indeed responsible for the action) that moves life forward. This emphasizes the importance of tradition, gathering together, and storytelling and as the way we celebrate and pass on our heritage and values. The accelerating drum beat musically sets up the concept of accelerating progress. A spontaneous explosion in space initiates a cosmic event that leads to the formation of stars, and the birth of planets. One of them is Earth. Matter cools in its new form and neighborhood. Vegetation appears. Large creatures roam the terrain. A brief white flare-up symbolizes the extinction of the dinosaurs, and the beginning of new forms of life. The animals shown all glance towards the camera – us – watching us as we watch them. A white horse gallops into frame and is "frozen" into a cave painting by the eyes of this new, clever creature; Man. Man leaves the safety of his cave environment and sets out to explore the Earth. This is not about HOW we get around ("transportation"), but that we set out to do so ("exploration")... a statement of the inherent curiosity of Man to reach out and see what Earth is about. It is the curiosity of man to discover that led to new forms of transportation. Exploration reveals the scenic wonders of the Earth, and Man settles far and wide, creating architectural and cultural monuments to new locations and ideas. Man’s inherent creativity is further developed and expressed; through the arts and through technological development. The pace of advancement picks up, and soon the space shuttle launches skyward, bringing our story up to the present era. We pause on the brink of a new Millennium to look back… where we have come from, what brought us here. From within the smoke clouds of the launch emerge memories of some of the beloved people of history, receding into the mists of time. The final "face" is that of an astronaut, who (reflected in his visor) sees the Earth in an important perspective: one place, home to all people. With a swirl of special effects, the image on the Earth transitions and for the first time WE, the audience, see the globe as Earth with full geography instead of pictures. This is a suggestion that we should all try to share the same perspective as the astronaut. The Earth is everyone’s home. Lasers and fireworks surround the entire Earth. The "Tapestry of Nations" puppets are depicted on the globe, dancing with the world as Act 2 concludes. We must "take the future in our hand" and make of it what we will. "1000 points of light" illuminate the entire audience, providing a chance for us to "look at ourselves." Then, after a moments breath... we are catapulted into the future as a new acceleration begins with a final barrage of fireworks. The female preshow announcement voice was performed by Mary Thompson Hunt until 2009 when it was replaced by a male performer. Many thanks to Don Dorsey for his help with the Reflections of Earth pages on this site.